As a stylist who has been pregnant twice now, I love styling maternity outfits. But expectant moms often find this challenge daunting. They’ll tell me they have no idea what to wear, what to buy, or when to “give in” to maternity clothes during pregnancy. So let’s debunk all the maternity outfit myths and build you a solid maternity capsule wardrobe that’ll carry you through those nine months in an effortlessly stylish way. Your body will change immensely in this nine-month span. And it will likely take you way more than nine months to get your body back to something you recognize. While this may sound bleak, let me assure you, it’s not. Your pregnancy can be such a fun style journey. I urge you to welcome it, befriend it, and give yourself the gift of a beautiful and comfortable maternity capsule wardrobe. With a few basics, you’ll have a strong foundation on which to accessorize and let your unique style shine through. A capsule wardrobe, by definition, is a collection of basics that you can interchange to make a seemingly infinite number of outfits. You can essentially create a capsule wardrobe for all aspects of your life –in this case, a nine-month segment. 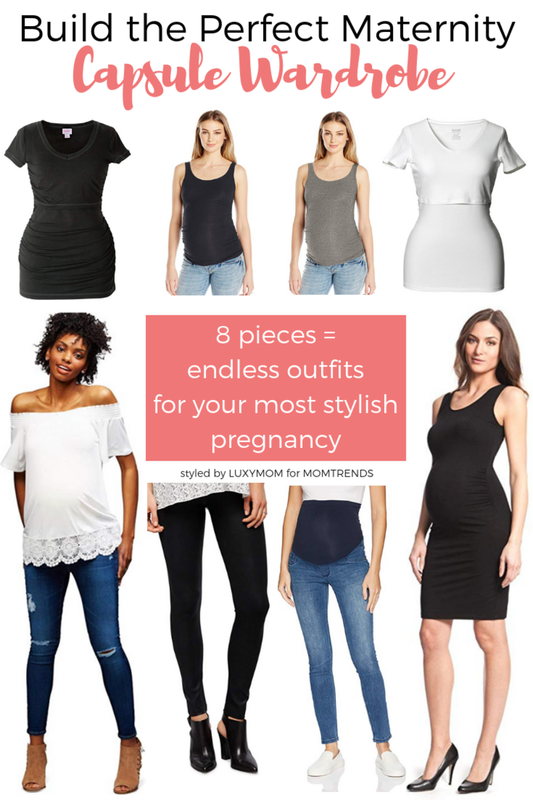 Below, I’m sharing my favorite basic pieces of clothing that you can mix and match to create a stunning and stylish maternity capsule wardrobe. I’m all for a little black dress in every aspect of your life. Whether you need one for work, for cocktails, for a black tie gala, or just for everyday wear, it’s so important to have this basic in your wardrobe. You just cannot go wrong. Very Audrey Hepburn. Here are two styles in very different price points, to show you that a simple black maternity dress can be found for all budgets. When I was pregnant, I absolutely loved my pieces from Seraphine. They’re such great quality and are so comfy. 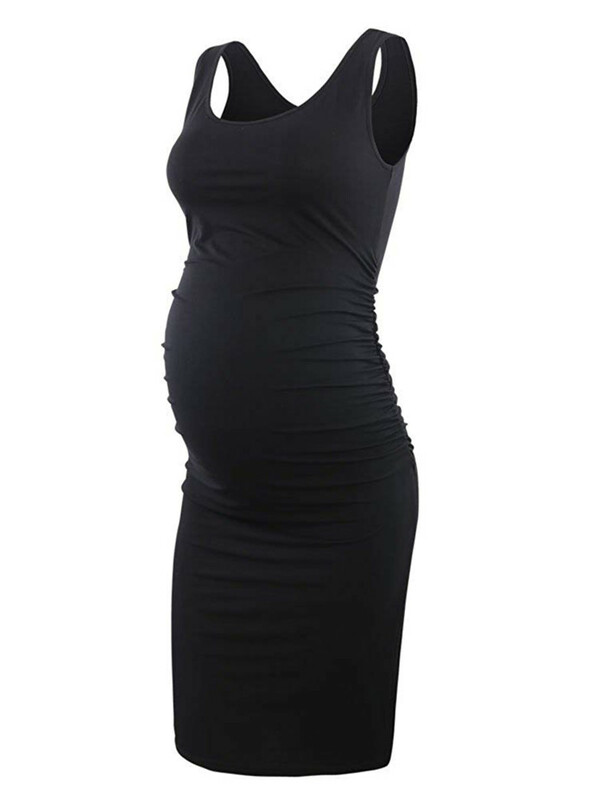 A simple, bump-hugging little black dress like this is the perfect foundation to your maternity wardrobe. Simply change up your look with variations in your shoes, accessories, and outerwear. This will be one of your most-worn pieces. This is an incredibly affordable version of the dress above. It’ll be a go-to for your entire pregnancy and beyond, and it’s a really great deal. Tank tops are the perfect layering essential when you’re pregnant. You can add scarves, sweaters, blazers, even sweatshirts to create new looks each time you wear one of these maternity tanks. Style Tip: I recommend including two tanks in your basic capsule wardrobe. However, you’re going to want to buy these in every color under the sun. This tank from Ingrid & Isabel is really forgiving with its shirring detail on the sides. While I was pregnant, I swore by Liz Lange maternity tank tops. They’re really long, and they can be worn well after your pregnancy is over. I currently own at least eight in all different colors, and my youngest child is three. So it’s been a while since I’ve been pregnant, and I can still attest to the reliability of this trusted find. You must – I repeat, MUST – allow yourself to “give in” to maternity jeans. I know it’s hard to acknowledge that your body is ready for some extra stretch in the midsection. But once you make the switch, you’ll be so glad you did. Every denim brand under the sun now offers a maternity style. I personally love a skinny jean, because they’re so versatile. But you can opt for whatever style makes you feel most comfortable. I’m sharing two versions of a skinny jean – one luxury pair and one more affordable – but still very stylish – pair. Style Tip: Buy two pairs of maternity jeans – one in a higher price point and one in perhaps a lower price point (and make sure one is a dark wash and one is a different wash or color) – so you won’t feel too put out spending money on items you won’t wear for too long. AG Jeans makes tried-and-true styles that are loved by women everywhere. Their Secret Fit Belly maternity styles are amazingly comfortable and flattering. 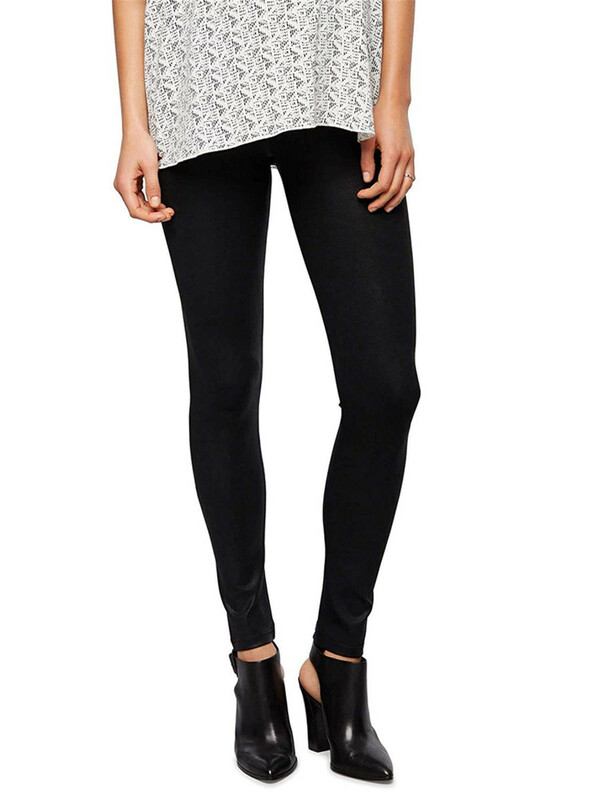 Check out the Legging Ankle Destructed Maternity Jeans for one of my top picks. Motherhood Maternity makes incredibly affordable maternity styles that are really cute, too. 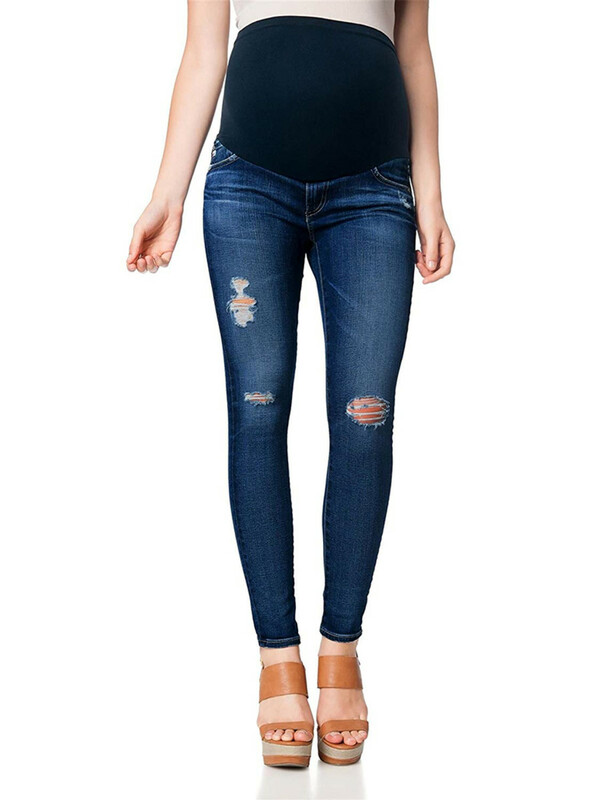 I love these maternity skinny jeans with a belly panel that stretches all the way over your bump for maximum support. 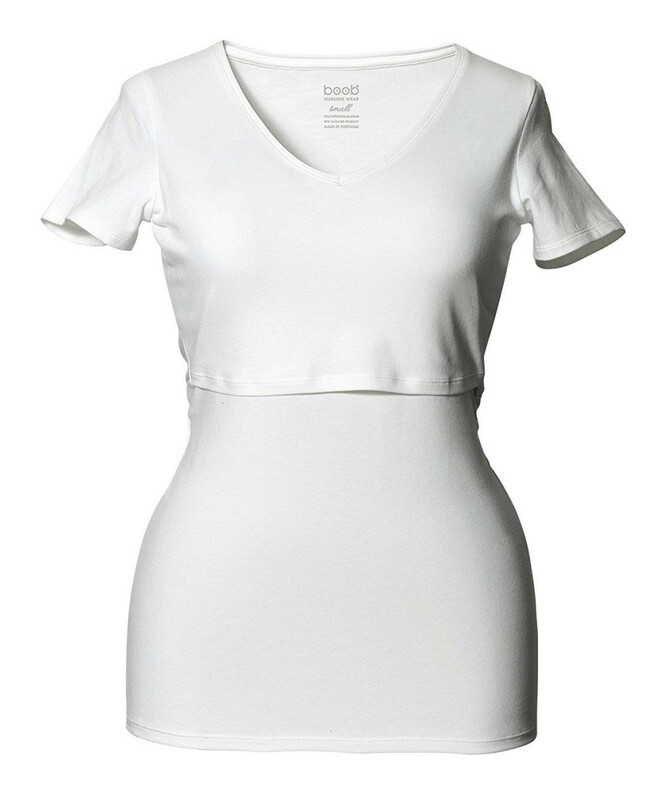 Similarly to maternity tank tops, t-shirts are the perfect layering pieces for any season. They give you a little more arm coverage than tank tops. And yet, you can still wear them under any piece of outerwear. These basics are versatile staples. This is an adorable basic t-shirt for before and after pregnancy. It’s another perfect layering piece that you can put under your favorite jackets, sweaters, and scarves. It comes in six colors, so you have plenty of choices. This pair of black maternity leggings will get you all the way through your nine months and then some. I actually bought this style myself when I was pregnant, and I’m glad to see they’re still making it. They are a really nice material, and they’re very well made. · One basic, bump-hugging little black dress. · Two pairs of maternity jeans. · One pair of maternity leggings. · Two maternity tank tops. Just by mixing and matching these eight pieces, you can make 16 basic outfits. Not only can you mix all the tops with all the bottoms, you can also wear your tanks and tees over this little black dress and tie a knot above your belly for a fun layered look. But wait – we haven’t even accessorized yet! So here we go – we’re about to blow this maternity capsule out of the water to give you maximum styling options! To make these pieces seem not-so-basic, you can bring in all the fun accessories you want – from shoes, to scarves, jewelry, handbags, sunnies, hats – you name it. Here are three ways to extend your capsule wardrobe and make even more outfit combinations. · Add three pairs of shoes: If you were to pick three different pairs of shoes from your closet that could each pair with each of the 16 outfits above – let’s say a pair of cute white sneakers, a pair of leopard print mules, and a pair of booties – you’d now have 48 outfit combinations! · Add a blazer and a cardigan: Just by adding two jackets to this maternity capsule wardrobe, you’re now up to 153 outfits! Fun Fact! If a pregnancy is nine months long, that’s roughly 270 days – which means these outfits (including shoes and jackets) cover 56% of your pregnancy. And that’s by wearing each one only once! 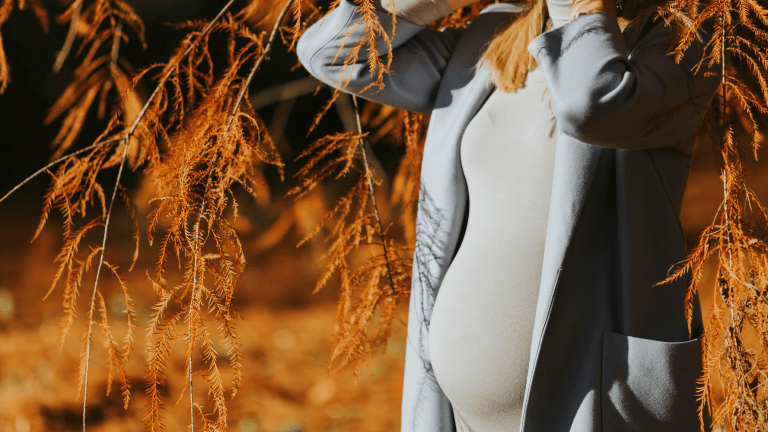 So you can see that taking the time to plan out a maternity capsule wardrobe with the best basics in neutral colors will help you make the most of your pregnancy style. Accessorize these maternity basics with all your usual accessories, shoes, and outerwear, and make your pregnancy style truly your own! Check out more from Libby Romano at LuxyMom.com.